On 11 February 2019, FIFA President Gianni Infantino officially opened FIFA’s third African Regional Development Office in Addis Ababa, Ethiopia. The establishment of FIFA’s newest regional office is intended to improve interaction with African Member Associations (MAs) and offer them support in developing strategies and accomplishing their development goals in close cooperation with FIFA’s administration in Zurich. It is the 10th regional development office to be opened by FIFA since the creation of the FIFA Forward programme in 2016. Attending the inauguration event were Ethiopian Minister of Culture and Tourism Dr. Hirut Kassaw, Commissioner of Sport Erstu Yireda, representatives of the Council for East and Central Africa Football Associations (CECAFA), Union of North African Football Federations (UNAF), Ethiopian Football Federation (EFF) President Isayas Jira Bosho, FIFA Member Associations and Development Director for Africa and the Caribbean Region Véron Mosengo-Omba and FIFA Secretary General Fatma Samoura. 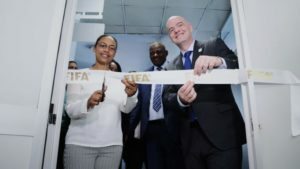 As part of the inauguration of the regional office, the FIFA President invited Dr. Hirut Kassaw to cut the ribbon, signalling that the office was officially open for business. Following the ribbon cutting, the FIFA President made a short address to those present and thanked the government of Ethiopia for hosting the regional office and for the warm reception both he and the FIFA delegation had received since arriving in the country. He also spoke about FIFA’s signing of a tri-party agreement earlier that morning with CAF and the African Union, to implement common strategies and programmes with a focus on the areas of education, good governance and the fight against corruption, as well as safety and security at football matches. He complemented the MAs present on their efforts in promoting football in the region and underlined the game’s unifying power. The new FIFA regional development office will be staffed by a dedicated and experienced team of full-time development officers who will work alongside 16 MAs in the region. As part of FIFA’s Vision 2.0 and its ongoing commitment to grow and develop football around the world, the opening of a new regional development office in Addis Ababa will ensure a dedicated FIFA presence in North and East Africa, providing MAs in the region with hands-on support to apply for and deliver football development projects supported through the FIFA Forward programme. Yesterday the new regional development office hosted a dedicated workshop to update MAs in the region about the new FIFA Forward 2.0 regulations approved by the FIFA Council in October 2018. The workshop provided an opportunity for MAs to understand the new Forward 2.0 regulations and measures introduced for the 2019-2022 cycle, as well as learning about the statutory obligations and funding controls FIFA has put in place to ensure transparency and the proper use of development funds distributed through FIFA Forward. Other FIFA regional development offices have also been established in India, Malaysia, New Zealand, Panama, Paraguay, Senegal, Barbados, South Africa and the United Arab Emirates.